What to know: An adorable short teaching the importance of inspirations that children have and the importantance of fulfilling your dreams. 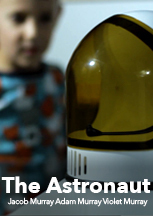 The Astronaut is an adorable short film that touches upon the importance of inspirations. One appealing aspect of this film is that it teaches children that their dreams are not ridiculous and anything you dream can be achieved. You can be anything you want! The short film also stresses the importance of not letting bullies get you down and to believe in yourself. The film follows a young boy, Jacob, whose dream is to become an astronaut and go to outer space. As the film progresses, Jacob is teased at school by a fellow classmate who tells him that he can't become an astronaut because it isn't a real career. An interesting aspect about all the key actors is that they are all related. The director, Adam Murray, uses his children to play the young boy and girl which makes the film seem even more realistic and relevant because they are so believable. The production quality for this short film is extremely well executed, especially for a first time filmmaker. The special effects in the beginning are astounding and out of this world. The lighting is well done and the visual quality is impressive. The only issue I have in terms of audio quality is that the filmmaker should have put a microphone on the boy, because it is difficult to hear him speak. Jacob's dream of becoming an astronaut may be at risk.